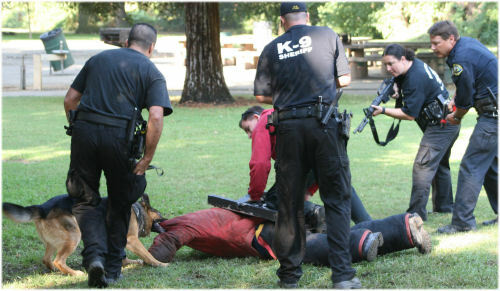 Police Dog Training is an essential part of our training program. On a daily basis our dogs are trained for the real work ! Our police dogs are trained on a daily basis as soon as they arrive in our kennels. Experienced trainers work with the dogs. Obedience is the first step in these training programs. Police dog training is based on that principle. The dog should obey the handler in any situation that may occur. Learning basic commands to the dog, so the dog executes those commands without any hesitation. Basic endurance and agility training is part of our training program. Besides these skills the handler should be able to rely on his dog in aggressive situation. When commands are given in situations that the police dog has to attack a suspect, no hesitation is allowed. Another basic point is of course the reliability of the dog. In our police dog training programs dogs are constantly trained by the same handler. This way we can draw a picture of the dog, meaning we know exactly what skills and capacities the dogs have, besides the character of all the dogs we train. Also detecting narcotics, objects is part of our police dog training methods. Dual purpose police dogs are in high demand. Green working dogs have all the capacities to become a full trained, certified, police dog. By working on these kind of dogs our trainers will find out what specific skills the dogs have and what skills our customers will have to work on in the police dog training. On request customer can be provided of with specific police dog training video’s. Our team will work during police dog training and video’s and pictures of the dogs are made. This way our customers get a real good ‘picture’ of our training methods and dogs we have in our training programs. Every now and then, video’s are also placed on social media sites like YouTube. Besides video’s we can provide our (potential) customers with photos of the police dogs we have in our kennels at the moment.